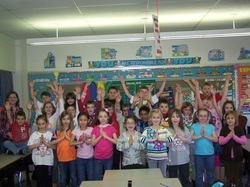 Daycare Yoga Classes:(Greater Johnstown Area): Add YOGA to your daycare's curriculum! These classes are designed to accommodate (2yr+) preschoolers and school age children simultaneously. Groups may be divided into pre-school and school age separately if so desired. Home School Groups: YOGA would be a great way to introduce health and exercise to home schooled groups of children as well. Your own living room can be enough space for 5 or more kids! We can play yoga outside in nice weather! You and Me Yoga: PreSchool Classes-One or two children per adult: children 3yrs+, play yoga in these fun classes designed to move, have fun and bond with your children. School age Classes- kids 4-12 years old (one adult up to two kids). 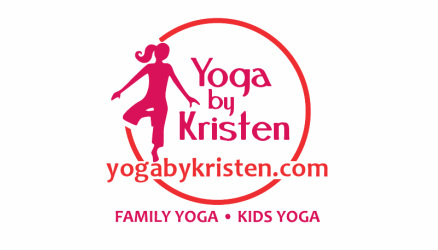 Family Yoga: Families can play yoga together-all ages...newborn to adult. At least one adult must be with children at all times. 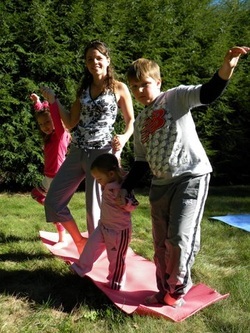 These classes are designed for families to play yoga together in a non competitive environment. School/Daycare groups-classes are $5 per child with a minimum of 5 children. ~photo below~ 2nd grade students learning to stretch, breathe and clear their minds before an exam during a Yoga by Kristen "Classroom Yoga" lesson. all ages can play yoga!